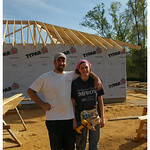 Faith is a major motivation for me and for Dave to spend a week building homes for low-income families. Jesus set an example of serving the poor, the sick, the disadvantaged, and said that any time we do an act of service for “the least of these”, we are also doing it for the Lord (Matthew 25). The Bible says that if we present ourselves to God as “living sacrifices”, it is considered a “spiritual act of worship” (Romans 12). It seemed appropriate to us to do so by sacrificing our spring break and vacation time and spend it doing hard work for God’s children rather than relaxing on the beach somewhere. This gives us an opportunity for us to give voice to those who have none (Proverbs 31) by sharing with our friends, families, and blog readers the truth of how working families are faring in the post-Katrina Gulf Coast region. Habitat for Humanity was founded on similar philosophies. It’s not a missionary organization, but it follows the example of Jesus Christ by caring for impoverished families all over the world, in a compassionate, respectful, and sustainable way. Habitat’s materials are quite clear about the fact that it is a Christian organization, starting with its mission statement and streaming through its website, printed materials, and its monthly magazine. Habitat is equally clear that it welcomes supporters and volunteers of all faiths to join in fulfilling its work. 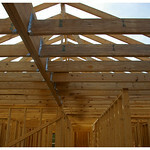 Check out the “Theology of the Hammer” page on its website: http://www.habitat.org/ap/theology_hammer.aspx. Dave and I have worked with Habitat on various job sites, and almost every time, the day is kicked off with a word of prayer. Sometimes it’s the Site Manager who leads the prayer, in whatever tradition he is comfortable with (we worked with a Site Manager in San Diego who was a Christian and always gave the prayer himself) and other times, the opportunity is opened up to the group for someone to offer the prayer. On Sunday morning, J.R. circled up the group (which at that point was us and the group of law students from University of Maryland) and gave us a brief safety talk. Then he asked if anyone wanted to start the day off with a quick word of prayer. There was an awkward silence for a minute, and then I volunteered. I said a quick prayer to the Lord God for getting us there safely, asking for safety on the job site, and for blessings on us and on the families that would live in these homes. The next day, although we had a slightly larger group, the same thing happened, and I offered materially the same prayer. That evening, we were talking with our friends from UMd, and a couple of them said they were working on writing a prayer for the next morning. I was glad, because I didn’t want to end up as the designated pray-er. Unfortunately, the next morning wasn’t nearly as structured, so there was no time of circling up for the safety talk or the prayer — everyone just returned to their projects from the day before. At lunch, the students who had written the prayer mentioned that they were disappointed about how they didn’t have the opportunity to offer their prayer that morning. So, after we’d eaten, we gathered in the living room of their bunkhouse and listened to what they had written. It was an inclusive speech about how we all had different backgrounds and beliefs, and how we were all gathered for a common purpose, which was to serve. It ended with a brief moment of silence. It was a good example of Habitat’s Theology of the Hammer. I wish they could have had the opportunity to offer it among the whole group earlier that morning. We didn’t have the opportunity to circle up on any of the mornings that followed — which was disappointing because with the Baptists from Pennsylvania on the job site, we may have had a few more people interested in offering the prayer. The Baptist group did, however, stop their work in the middle of the morning on Friday to have a prayer service on the grounds of some of the completed homes, as well as the ground next to our bunkhouse that was scheduled to begin next. They blessed the ground, as well as one of the families (the mother of which was present). 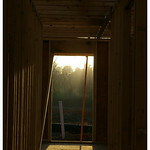 For some reason, we weren’t invited; but we kept up our spiritual act of worship by using a nail gun and cordless drill!